We finished canning 28 quarts of grape juice last night at about 11:30. This morning, I slept in until nearly 8 o'clock --unheard of in my life. The task for today: make 4 batches of grape jelly. The grape juice is in the fridge, it needs to set overnight before straining. Just as well since I was busy making juice! We crushed the grapes with my potato masher, then briefly simmered them with a small amount of water. Dan then fed the crushed grapes through our Italian tomato press, and we collected the resulting juice in large jars to store in the fridge. Today is gorgeous, clear as a bell and sunny with a slight breeze. We gathered as many half-pint jars as I could find last night and washed them. We'll be able to process the jam outside on the deck using the turkey fryer propane burner, which heats a huge amount of water a LOT faster than even the high output burner on my gas range. So at least I'll get to spend a few hours outside today before I head in to work for the afternoon, for a special program. Sob. I really need to do some gardening! 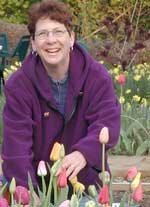 I have three new perennials, and a lot of allium bulbs to plant. With a gift certificate, I purchased the Music of the Spheres (photo on the left from WWF) plant collection from White Flower Farm. 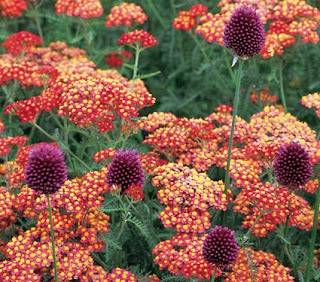 I also purchased some drumstick allium bulbs to create this collection (photo below from WWF) with some achillea I already have in my new flower bed. When I'm actually going to plant these, I'm just not sure..... Time is flying, and today is the first day of autumn. I miss summer already! Blogger is having a little trouble with photos just now, so pictures will follow soon. Time to get to work! Hey Renee, welcome back to blogland! I'm glad to hear you like the alliums, I love their shape. 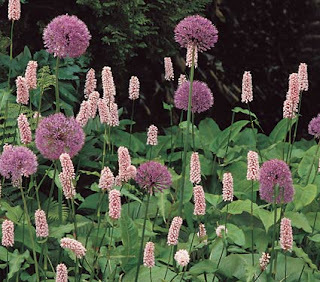 WFF says this persicaria does not spread like the other knotweeds, and since it will be ina a bed with plenty of room and another invasive (creeping bellflower), I'm willing to give it a go and the two plants can duke it out if necessary.